Click here to view full picture gallery. The ceremonial swearing-in of the Honorable Madeleine Z. Bordallo, Guam Delegate to The United States Congress took place on January 23, 2017 at the Latte of Freedom, Hall of Governors, Ricardo J. Bordallo Governor’s Complex Adelup. 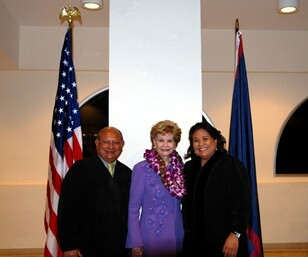 Chief Judge Frances Tydingco-Gatewood administered the oath in the presence of distiguished guests, family and friends of Congresswoman Bordallo.